Dynaliner is the most effective automotive lightweight thermal insulator available, and perfect to use on top of Dynamat Xtreme. It is a soft, self-adhesive closed cell rubber with thousands of cells packed extremely close together, which gives the material near zero air infiltration occurrences. This is the key to its ability to reduce heat, as well as resist oil and water. Since it will not hold water, it will not promote rust or mildew like most under carpet padding and thermal insulators. Dynaliner is also durable enough to be crush and tear resistant. Because of its durability and ability to resist oil and water, Dynaliner is long lasting. 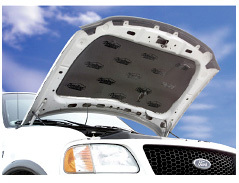 Dynaliner has the highest heat blocking properties available in a single layer synthetic foam. Combined with Dynamat, Dynaliner nearly doubles the total thermal resistance ability. It provides excellent insulation for the roof, firewall, floor, quarter panels, doors, and even under the hood. Dynaliner is available in 1/8”, 1/4”, and 1/2” thicknesses. Use the thickest one that your space will allow. 1/2" thickness best for Floor, Roof, Underhood, and Fiberglass Enclosures.